So why did Michael dissent from the consensus on this point? Is this a reactionary and defensive stance? Is Michael wary of giving any indication that he harbored resentment against her for her liaisons with Tommy? Now let's assume, as we suspect, that Michael did not go to the Terrien's [Terriens']. Why would Tommy and Jim Terrien want to make us believe he did? Mark #4 10:15 The next time we have Ken and Tommy pinned down is sometime around 10:15 pm, depending on who you believe is more accurate (Littleton says Tommy came into the master bedroom at around 10:03 pm. Tommy says he arrived at around 10:17 pm). Let us assume they are both being entirely honest to the best of their recollection. After leaving Martha, Tommy says he went up to his room for an indeterminable period of time. He then went down the staircase from the third floor to the second floor where he noticed that his father's bedroom door was open. Inside, Ken was sitting on the lounge chair, watching The French Connection. Tommy joined him and sat on the bed. After watching the chase scene, Tommy says he went down to the kitchen for a bite to eat, and then went up to bed. Littleton says that Tommy came into the bedroom about twenty minutes before the chase scene. The chase scene began at exactly 10:23 pm. If Tommy really came up twenty minutes earlier, Ken would have been in the kitchen with Julie at that point. Most likely, Tommy came up later than that, probably around a quarter past. Littleton says that Tommy, in his estimation, could not have murdered Martha Moxley before this point. He seemed completely normal and relaxed at the time. If Julie has Littleton in the kitchen at 10:05 pm, and Tommy has him in the master bedroom shortly thereafter, it seems virtually impossible Ken could have committed the murder of Martha Moxley--assuming, as most do, that the murder occurred just after Martha left Tommy's presence and headed for home. Could Tommy have killed her after their sexual encounter. Littleton says no. 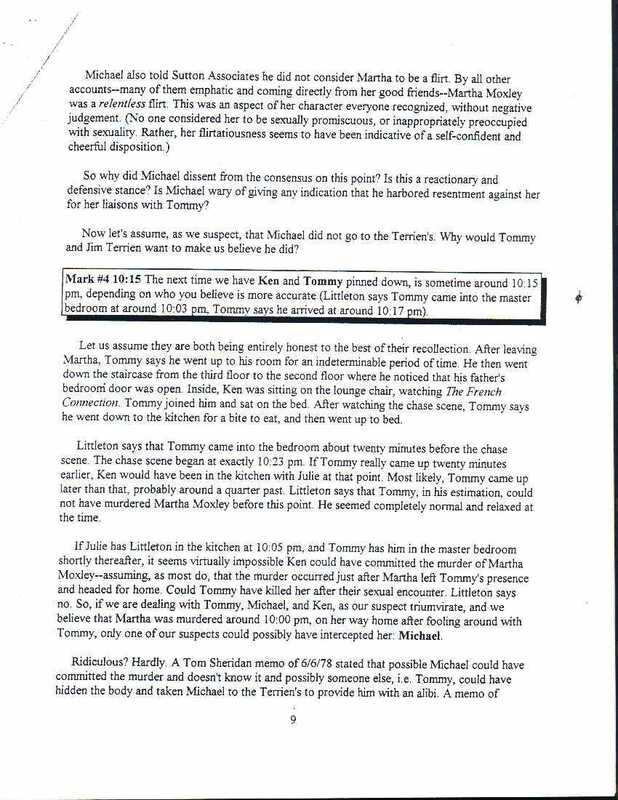 So if we are dealing with Tommy, Michael, and Ken, as our suspect triumvirate, and we believe that Martha was murdered around 10:00 pm, on her way home after fooling around with Tommy, only one of our suspects could possibly have intercepted her: Michael.